On May 26, 1942 General George C. Marshall established the Hawaiian Provisional Battalion, returning to military service many young Nisei who had been summarily discharged after the December 7, 1941 Pearl Harbor attack. From these, 1,300 were selected to ship out on June 5th under the guidance of 29 white officers under the command of Lieutenant Colonel Farrant Turner. By mid-June the unit was attached to the 2nd Army at Camp McCoy, Wisconsin and preparing for six months of basic training. The Hawaiian Provisional Battalion was re-designated the 100th Infantry Battalion. LT Paul E Corbin was one of those young officers chosen to lead these patriots into battle. The battalion was assigned to guard duty in Africa, but received their baptisism by fire in Italy, earning the nickname, the 'Purple Heart Battalion.' After the fall of Rome, the 100th Battalion and the 442nd joined to become the 442nd Regimental Combat Team. The 442nd would continue to fight their was up the west coast of Italy, where LT Corbin was twice wounded in action, earning him two Purple Hearts. In September 1944, the RCT moved by transport ship to southern France and then by road to the Vosges Mountains, 40 miles short of Germany. To proceed ahead to the border, the RCT needed to secure the town of Bruyeres, France, which was surrounded by four hills, all heavily guarded by the Germans. After vicious fighting, the 442nd RCT secured the town and then the 100th Battalion moved east to the town of Biffontaine. 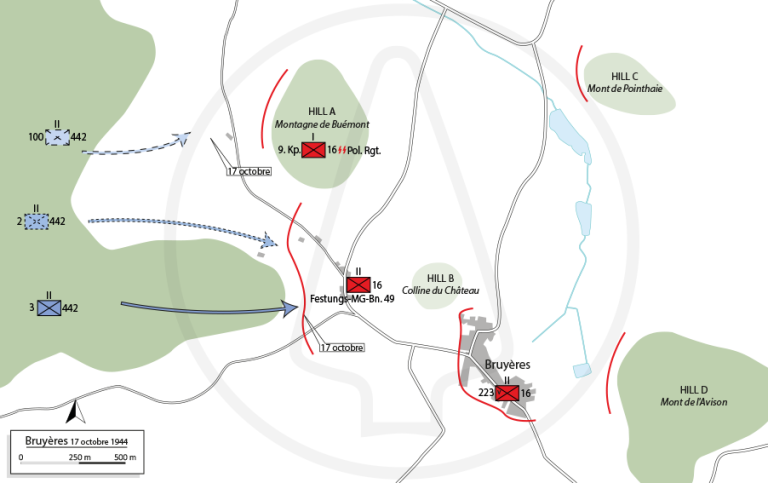 They were soon encircled by German forces and subjected to heavy artillery and rocket fire. Low on supplies, the 100th had to hide in building cellars and wait for assistance. LT Corbin assisted in organizing and leading a supply train though the German forces to the encircled battalion. Although LT Corbin and his men twice encountered enemy patrols which ventured to come within ten yeards of them and were fired upon several times from enplaced enemy positions, by superior leadership and the audacity of his actions, LT Corbin was able to successfully reach the beseiged battalion with the supply train intact. LT Corbin's gallant leadership and fearless determination were largely responsible for enabling the battalion to hold its ground, and subsequnetly achieve a significant local advance. For his gallantry in action on this date, LT Paul E Corbin was awarded the nation's third highest valor award, the Silver Star. 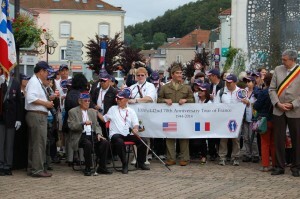 After fighting in southern France and Germany, to include rescuing the 'Lost Battalion,' the 100th Battalion and LT Corbin returned to guard the Franco-Italian border. Returning to northern Italy, the 442nd RCT and LT Corbin would participate in the Po Valley Campaign, fighting right up to the end of of war in Italy on 2 May 1945. LT Corbin would muster out of the US Army on 15 December 1945 at Fort McClellen, Alabama.